Geeta Roy was born in 1930 at Faridpur, East Bengal in a Zamindaar family. Her parents moved to Bombay when Geeta was just 12 years old. Geeta got her music training from the composer Hanuman Prasad who later launched her in Bhakta Prahlad (1946). She sang two lines in two songs of the film: 'Ab Jani Re Pehchani Re.' and 'Suno Suno Vinti Hamari' but that launched her singing career. She also sang in films like Kashmir Ki Kali (1946 - 'Ye Kisne Meri Hasraton Me Aag'), Raseeli (1946 - 'Neha Laga Mukh Mod Gaya' and 'Nainon Ke Pyale Se') and Circus King (1946 - 'Preet Kisi Ko Na Chhode'). Music director S. D. Burman liked her voice and offered her a solo in Do Bhai. 'Mera Sundar Sapna Beet Gaya' was her first big hit. After that Geeta got many offers and sang many lovely songs. Geeta's songs had been mainly devotional or slow songs but Baazi (1951) changed that. Every song in Baazi was a hit but 'Tadbeer Se Bigdi Hui Taqdeer Banaa Le' stood out. The jazzy music brought out a whole new style to Geeta's singing. The appeal in her voice and the ease with which she adapted to the Western style of singing was amazing. From then on Geeta Roy was the singer chosen for club dances or seductive songs. During the recording of the song she met and fell in love with the young director of the film, Guru Dutt. The two were married on May 26th, 1953 in a Bengali style wedding. They had two sons Tarun and Arun and a daughter Nina. Geeta went on to sing some of her best songs in her husband's films while she continued to sing for others also. Around this time, a new composer O. P. Naiyar approached Geeta to sing for him. The movie Aasman bombed but she saw his potential and recommended him to Guru Dutt. In Aar Paar, both Geeta & O. P. Naiyar achieved success with 'Babuji Dheere Chalna', 'Yeh Lo Main Hari Piya' and all the other songs. They created a successful series of hits. The Geeta & S. D. Burman team created many hit songs. Films like Do Bhai, Baazi, Munimji, Nau Do Gyarah, Kaagaz Ke Phool and Sujata are just some examples. Her sensuousness made her a favourite for jazzy or seductive songs such as 'Banki Adayen' from Amanat, 'Aye Dil Mujhe Bata De' from Bhai Bhai and of course 'Mera Naam Chin Chin Choo' from Howrah Bridge. There are just too many songs to name. She sang for most actresses of her time from Geeta Bali to Waheeda Rehman. By the late fifties, her marriage had run into rough weather and was on the rocks. She had personal problems and she almost quit singing. She could not accept Guru Dutt's relationship with Waheeda Rehman. Guru Dutt launched a new film Gauri (1957) with the intent of launching Geeta Dutt as a singing star and it was to be India's first film in cinemascope. Unfortunately the film was shelved after just a few days of shooting. To make things worse both of them began drinking Alcohol heavily. Guru Dutt committed suicide on October 10th, 1964. Geeta was shattered by his death and suffered a nervous breakdown. When she recovered she found herself in a financial mess. She sold every thing she could to pay off their debts. She tried to resume singing again, cutting discs at Durga Puja and performing on stage, even doing a Bengali film, Badhu Bharan (1967) as heroine. The last film she sang for was Anubhav (1971) which had the music composed by her brother Kanu Roy. Who can forget the songs she sang in Anubhav, 'mujhe jaan na kaho meri jaan', 'meraa dil jo meraa hotaa'; and my personal favorite 'koi chupke se aake sapne sajaa ke bole ki mai aa rahaa hoon'. Unfortunately her health kept failing. She died of cirrhosis of the liver on July 20, 1972 at the age of 41. Geeta sung about 1,000 Hindi songs for most of the Music Directors of her time. Her songs include solos, duets as well as chorus songs. 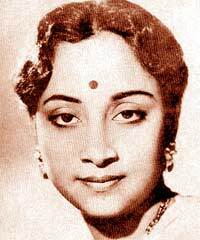 She also sang many Bengali songs and my favorite is 'tumi jai aamaar ogo tumi jai aamaar' from Harano Sur which was filmed on the legendary Suchitra Sen with Uttam Kumar. How does one pick the best song Geeta Dutt ever sang? There is no way to do that so all we can do is come up with personal favorites that we like for one reason or another. Geeta Dutt is gone but her songs will live forever. Even today songs that are 50 years old sound fresh and appealing.